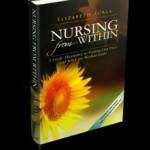 I thoroughly enjoyed Elizabeth Scala’s book Nursing from Within ™. Through personal reflections and stories that all nurses can relate to, Elizabeth writes well on not needing to change the “where” that nurses find themselves working but working to change the “within”. Many times we just need a guide to help us see perspective and make some internal shifts. Elizabeth does just that and more in this book. Each section of Nursing from Within ™ offers the reader to personally reflect, question and move forward in an empowered fashion. Elizabeth reveals how it is possible to overcome common ailments such as exhaustion and burnout to rekindle passion and discover contentment. One of the most beneficial sections for me was reading about the peace that is found in the here and now. Elizabeth explains since we are always rushing (a common ailment of the nursing profession) and distracted by multiple streams of information coming at us that we are missing the peace available for us. “Just for Today” is truly calming as Elizabeth explains that the more you can stay present in a busy moment the happier you will feel. Just for Today; promise yourself to read Elizabeth’s book! Nursing from Within ™ is an innovative and uplifting guide for nurses at all levels of the profession. Learn how to shift your inner perspective so you can enjoy the work of helping others, regardless of how stressful or challenging the environment you are working in may be. Are you ready to rediscover the joy and passion of nursing? ‘Nursing from Within: A Fresh Alternative to Putting Out Fires and Self-Care Workarounds’ is available now. 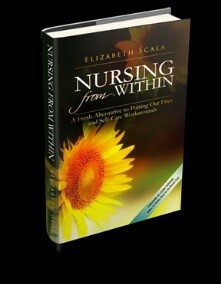 Get your copy today by visiting Elizabeth Scala’s site, or purchase directly from Amazon. This entry was posted in Nurse Entrepreneur. Bookmark the permalink.